Invigorate your customers' senses and indulge them with an aromatic cup of Big Train's Blended Ice Coffee! Made with pure Arabica coffee, with no hydrogenated oils or trans fats. 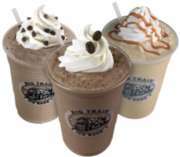 In addition to being gluten free, Big Train Blended Ice Coffee is Kosher and Halal Certified. Simple to prepare - just add water (or milk) & ice, blend, top with whipped cream, and serve a decadent coffee frapp�! Can also be prepared as a delicious cafe latte by just adding hot water! This is your Big Train cooling solution! Blended Iced Coffee is a delectable blend of award winning Arabica coffee and decadent flavors. Easy to prepare and sure to satisfy all coffee lovers! One case = 25 2.8oz single serve packets.